It’s hard to recall what the first flight simulator game I played was. I believe it was Wing Commander on the PC, before I graduated on to other space games like the X-Wing and TIE Fighter series, as well as Descent. Either way, it was love at first sight. The cold loneliness of space translated perfectly to the video game realm, and the possibilities were endless since the theme wasn’t tethered to any particular planet or rules. Any given day my adventures could take me to another uncharted region I’ve never seen before, either teeming with life or completely silent. And that really is the magic of sci-fi — you can never truly be prepared for what it might throw at you next. Hyperburner ($2.99) doesn’t really break any conventions that have been present for the past 20 years or so, but it’s one heck of a ride. 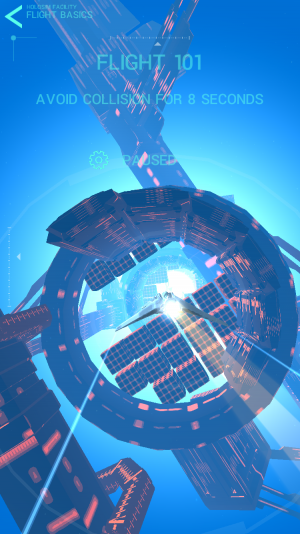 While it has an endless mode, Hyperburner is far from a generic flight simulator. The soundtrack deserves a special callout, as it’s almost like a mix of noire and electronica, and the main theme feels like it could be set to its own TV show. The entire presentation has a lot of flair as a matter of fact, with vivid colors on just about every screen. It looks cool and flashy without feeling too generic — because even though you’ve probably flown through various sectors of the vast expanse of the uncharted universe before, it still feels fresh. Although there isn’t explicitly a story that unfolds over the adventure the architecture kind of tells its own tale. And so does the control scheme, which provides a heap of different options to choose from. You can go with the traditional third-person view, or first-person cockpit, both of which change up your fundamental approach to the game. But what I really dig is the power to fine-tune the sensitivity of your ship (which can be adjusted to the tee) and test it right there on the options menu. It’s a really cool feature, as is the instant pause mechanic when you lift your finger off the screen. It’s saved me many a time when I looked up at something else. Each zone has its own signature art style, complete with unique hazards to face. Said objects might be moving or static, but either way it’s going to take some skill to navigate around them. The patterns are wonderfully crafted, almost puzzle-like — so there’s no feeling of cheap deaths or haphazard design flaws. Every death is your fault, and betters you in some manner. There’s only several worlds but each one looks entirely different, almost like a different game in a way. They throw a lot of very tight “thread the needle" type of situations at players constantly, forcing people to learn from their mistakes as they hit that replay button over and over. It’s addicting and beautiful at the same time. 30 levels doesn’t seem like a lot, but there’s a good amount of replay value built if you repeat stages. This is mostly because of a faster speed option, which yields a greater score. But if leaderboards aren’t your thing, it can’t be understated how much fun it is on a faster setting. It’s almost like the game was made to be at this level, and banking in and out of turns feels better than ever here. The shield will grant you a tiny amount of respite in that it’s not an instant death after colliding with an object, too. Beyond that, there isn’t a whole lot to do if you aren’t keen on revisiting existing content. There’s more ships to unlock, most of which feel the same. Sure there’s no premium purchases, energy, or power-up for money mechanics, but you can probably breeze through it in one long day session. It’s worth it, mind, but there could easily be something more — even the endless modes don’t feel as fulfilling as the objectives. 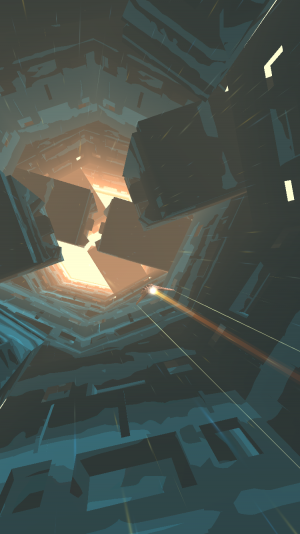 As long as you’re okay with a well-paced adventure that doesn’t let up from start to finish, you won’t be disappointed with Hyperburner. It might not deliver as much extra junk as you’re used to for a premium game, but it’s engaging from minute one.